The stalwart cocktail classic has been around for almost a century and continues to be the go-to drink for weekend brunches, parties, and game-day tailgating. The Bloody Mary Book features 65 new and innovative recipes to surprise any party guest. 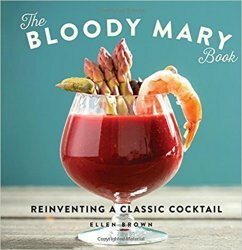 A basic Bloody Mary requires no more skill than simply pouring, but this book makes use of all possible flavors, different liquors, and a rainbow of garnishes that can be purely decorative or practically serve as a main course. The drinks are a dizzying array of creativity, from the Vegan Mary, which is packed with umami, to a Middle Eastern Mary, adding cumin, coriander and harissa for an extra bit of spice, as well as a Gazpacho Mary, pureed with onion, garlic, peppers and cucumber to yield a veritable meal in a glass. The bar food complements the beverages nicely, with Scotch Eggs, Tuna Poke with Mango and Avocado, Smoked Salmon Spread, and Spiced Mixed Nuts, and the garnishes start with homemade Dilly Beans and pickles and ramp up to Beef Jerky and even Ceviche! Whatever your fancy, the Bloody Mary is the perfect weekend drink.